As anticipated, the long-rumored Galaxy S5 was the highlight of Samsung’s Unpacked 5 press event at Mobile World Congress. The handset would best be described as an incremental update instead of a major departure from the tried and true Galaxy S line. New for 2014 is a 5.1-inch FHD Super AMOLED display operating at 1,920 x 1,080, a quad-core CPU clocked at 2.5GHz, 2GB of RAM, a 16-megapixel rear camera and a 2.0-megapixel front-facing shooter. Bluetooth 4.0, NFC, an IR blaster and a microSD card slot all come standard. The rear cover features a perforated design (sorry, no metal chassis here) that's available in blue, white, black and gold. It'll ship with Android 4.2.2 Kit Kat and Samsung's familiar user interface alongside multiple S-branded apps. Elsewhere, the GS5 features Samsung Knox mobile security for enterprise users and a 2,800mAh battery good for up to 10 hours of web usage and 12 hours of video playback. Should you still find yourself low on juice, an ultra power saving mode can turn the display to black and white and disable all unnecessary features. Samsung claims this can extend the GS5's battery life by up to 24 hours in standby with just 10 percent of battery life left. Samsung's latest also includes full LTE Cat.4 coverage, 802.11 a/b/g/n/ac HT80, MIMO (2x2), and a download booster that bonds your Wi-Fi connection with LTE for a faster and more stable connection. IP67 water and dust resistance is also included which of course isn't the same as water proof. Instead, it can be submerged in up to three feet of water for up to 30 minutes. The GS5's 16-megapixel camera is equipped with a number of nifty features such as improved real-time HDR functionality for richer tones, a fast autofocus system and a selective focus mode that simulates shallow depth of field produced by higher-end DSLR camera lenses. Not to be confused with an LED flash, another sensor just below the rear camera is used to monitor your heart rate. Simply place your fingertip on the sensor and within five to 10 seconds, your current heart rate will be given. Another key feature on the GS5 is a fingerprint reader. Much like the one found on the iPhone 5s, this scanner is used to validate your identity (unlock the device, make secure payments, etc.) and activate a private mode that only you can access. Prints are encrypted on the device, stored locally and never shared. Those with kids will appreciate the new kid mode. As the name suggests, this is a kid-friendly mode that comes pre-installed with age-appropriate apps and will prevent your little ones from perhaps seeing something they shouldn't. 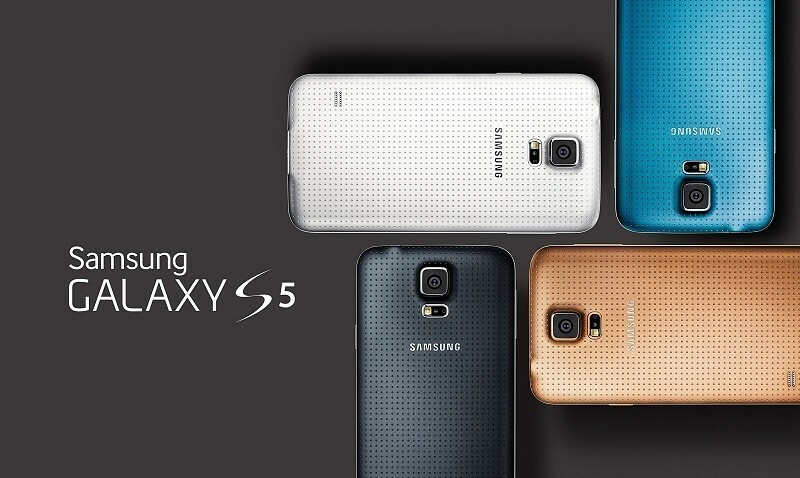 The Samsung Galaxy S5 will launch on April 11 around the world and on all major US carriers in capacities of 16GB and 32GB. Pricing, however, was not mentioned during the Unpacked event.